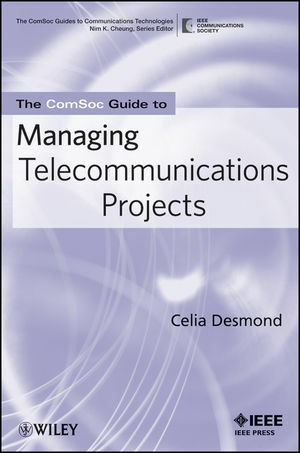 Celia Desmond is President of World Class Telecommunications, which provides training in management skills in business and telecommunications engineering environments. She is the project manager for the IEEE Communications Society Certification in Wireless Communications Engineering Technologies. Desmond has taught project management at four universities. A past president of IEEE Communications Society and past vice president of IEEE Engineering Management Society, Desmond has lectured internationally on programs for success. She is a Senior Member of IEEE. CHAPTER 1 Evolution of The Telecommunications Industry. Competition for Long Distance Services. Internet and Multimedia Disrupt the Basic Networks. CHAPTER 2 Why is PM Important, Especially in Telecommunications? The Best Way to Market. CHAPTER 3 Project Management Basics. CHAPTER 4 Getting Started on Your Project. What Happens Before the Team Arrives? General Description, Skills Analysis, and Stakeholders, and Risk Analysis. CHAPTER 5 Who Is Involved? The Type of Company Hosting the Project. CHAPTER 6 Setting Business and Project Objectives. CHAPTER 7 What Is to be Included? CHAPTER 8 Going Outside the Company for Products and Services. CHAPTER 9 Managing Risk in Telecom Projects. Contingency is Expected to be Spent. CHAPTER 10 Who Tells What to Whom? CHAPTER 11 Creating the Timelines. CHAPTER 12 Managing the Costs. Project Budgets and Planning the Project Cost. Project Communications Planning and the Communications Matrix. Informing the People of Their Roles at the Meeting. Using the Meeting Time Effectively. Motivating People to Communicate Properly. CHAPTER 13 Managing the Developments. CHAPTER 14 Managing the People. Managing the Workloads of the Team Members. Some Suggestions for Good Participation and Good Management. CHAPTER 15 What Is the Gain? Understanding the Value of the Product.